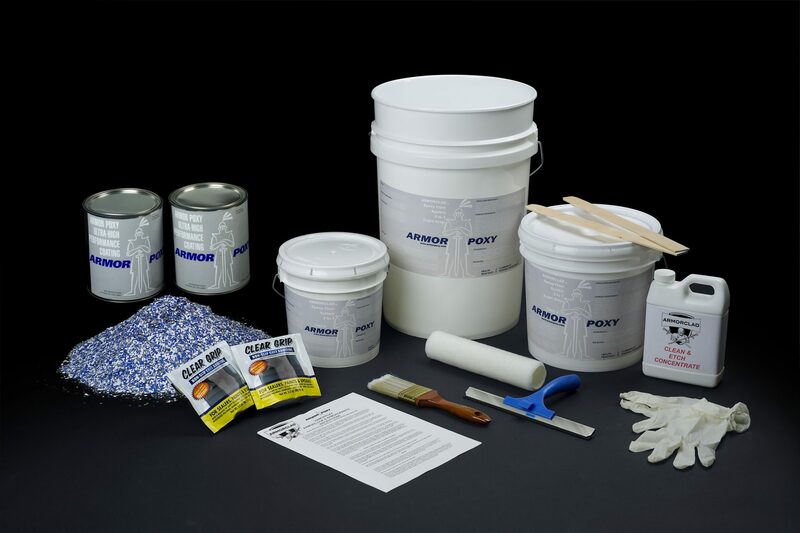 Kit includes: ArmorEtch etching solution, 3 gallons of 100% solids (the finest available) 2 part epoxy, UltraGlaze 1-part industrial-grade non-yellowing clear topcoat, Clear Grip Non Skid Additive, 6 lbs of decorative epoxy flecks, rubber gloves, industrial-type mechanical mixer (for your drill), mixing sticks, application squeegee, roller pad, instructions, and brush (for corners and edges). Comes packed in a reusable 6 gallon heavy duty mixing bucket. For larger garages, order the Add On Kit size in addition to Master Kit for 900 sq ft. Order additional Master Kit for up to 1,200 sq ft.
We always recommend priming your floor for best results particularly if your floor has been previously coated, your floor has a non-smooth texture, you have grinded or mechanically prepared your floor, or the floor has uneven porosity, we suggest using the ArmorClad primer as a pre-coat. 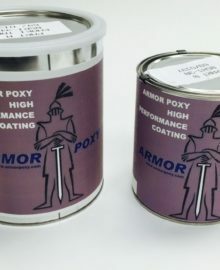 Priming also extends coverage of the Armorclad epoxy by up to 30%, allowing the epoxy to cover more surface area. Primer is included here as an option for an additional charge. Please note that porous floors or thicker applications of ArmorClad could yield less coverage. Beige color will yield less coverage, and that darker shades of concrete, or more porous covered in beige may require a second coat, so we recommend use of our ArmorClad Primer for beige and lighter base color projects. Red requires two coats and comes with a 2 gal kit of red pigmented 2-part epoxy primer and charges out at an additional charge. Another available option is our 2-part military grade topcoat, ideal for working garages or where fuels and solvents may come in contact with the floor. The 2-part military grade topcoat option is available for an additional charge. Kits come complete with everything you need. Lifetime limited warranty. Call us for large project-type jobs for special pricing.